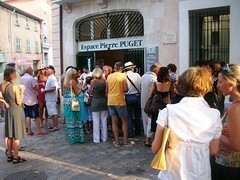 Ollioules is located South France in the region Provence-Alpes-Côte d’Azur, 7 km northwest of the naval port of Toulon. Beautifully set in fantastic natural scenery at the foot of the big mountain Le Gros Cerveau, this highly privileged location close to the sea but still a little away from the hectic coast life makes it an ideal holiday resort. 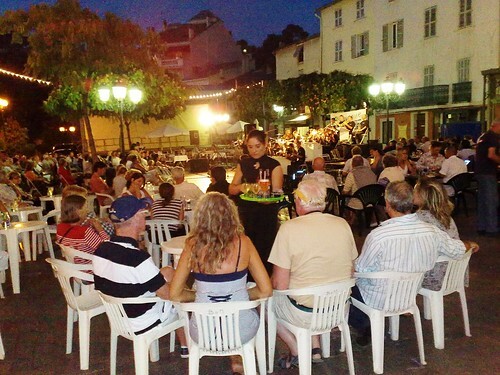 It’s a charming medieval village with well-restored houses, streets with arcades and flowery balconies. Ollioules (population of about 12,000) is renowned for its flowers and the town is, actually, called la reine des fleurs (the queen of the flowers). The name, Ollioules, comes from the Roman word, Oliolis, which signifies olives which have been cultivated in this area for thousands of years. 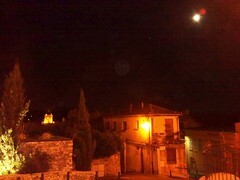 By night in the most charming town at Provence at full moon. Left: Mayor, Robert Beneventi opened – Right: Food and drinks was served outside. Like I sad in my last post; it’s impossible to fully describe in words how wonderful this time at our Blog Gathering was. Reading between the lines and watching the pics, hopefully gives you a clue. Oh Renny, what a wonderful spot for a Blog Event! It looks so wonderful and serene. And the Jazz concert could only have been wonderful, as I love Jazz music! Renny what a blessing!! This looks just marvelous. Oh I can just imagine how very fun it was. My youngest is blessed to be able to travel like this as she is married to a DR. But, for us, I am afraid it will forever remain a dream. I had great plans to travel with our photography when Walter retired. But, unless a miracle happens I am afraid most of out travels will be very limited. I am so very very happy for you and your family. Thanks for always sharing your wonderful adventures with us. I live my international dreams vicariously through your blog!! Please, please keep it up! Such a beautiful place….love it! Renny, I wish we could make a reply – in real life. Beautiful Photos from a very charming area and wonderful memories. 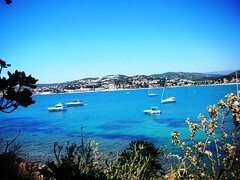 Southern France looks like a sunny paradise… I’d love to be there in the sun, sea, and sand! Looks fun! It’s really fun for me to read about your French trip. That must have been so much fun! The pictures are very good, especially the ones taken in the evening. Queen of Flowers, what a great name for a city. Renny, you adorable man…thanks for tracking me down and bringing me back to your festive blog! Nothing like Provence in the summertime, and to have the whole gang together celebrating must have felt a little bit like Heaven on Earth! WOW …PLease invite to the next one !! Brilliant !! I’m green with envy, I’ve enver been to that part of France and am now very tempted. Wow Renny! The place is festive! I bet there’s lots of delicious food coupled with good friends. I am certainly envious. LOL! This place is really festive. I am tempted by your experience. What a wonderful place! Thanks for sharing. You are a such wonderful photographe! I really like the picture at the Jazz concert taken from the back!!! 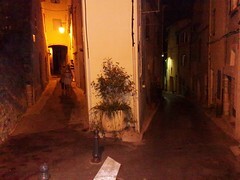 Yes I remember our walk in the night through the middle age streets! It was a magical moment in a quiet warm night under the moon! 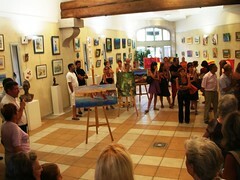 And the exhibition with our Mayor…! 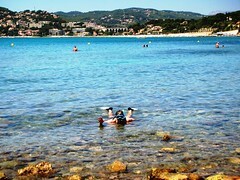 the pictures of the beach are wonderful!I was there two days ago with mask and tuba and met big fishes around!!! 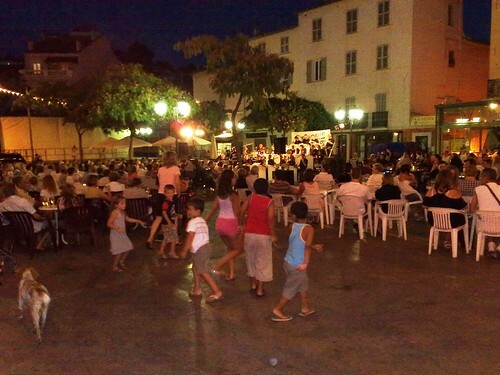 Aah, France always offers this kind of celebratory event in Summer – I remember that, when I lived there, I used to go and attend some of these events (it is delightful). Ollioules seems gorgeous! 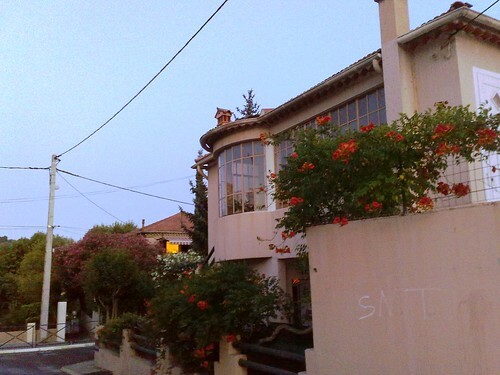 I like the narrow streets (so typically Latin European) and the houses too. Provence is very beautiful! You had a wonderful time, I can tell :D! Thanks for sharing it with us and now I am off to read your previous post! so glad it was such a lovely time for you and diane. It is really nice place of good entertainment. ……………..